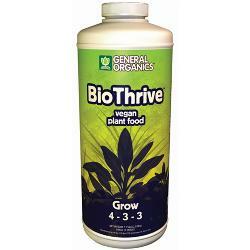 BioRoot is a natural plant growth supplement that helps plants establish healthy and vibrant root systems. It contains plant and mineral-derived organic acides and humates that encourage profuse root development. BioRoot is outstanding for seedlings and cuttings as well as all phases of plant growth. Use BioRoot with all types of plants growing in all kinds of garden soils and potting mixes. Works with all plant foods. Add 1 teaspoon of Bioroot per gallon of water. Add 2 teaspoons of Bioroot per gallon of water. Derived from: Alfalfa meal, Brewer's yeast, Potassium sulfate, rock phosphate, sea kelp and soybean meal.